Sometimes when I am planning classes or just trying new stamps or techniques I end up with a pile of ‘experiments’ which were not what I had hoped for but were still worth saving. They often go into the ‘pile of possibility’ to be used later. From time to time the ‘pile’ gets so big I have to throw some experiments away because I know I will never actually choose to do anything with them. 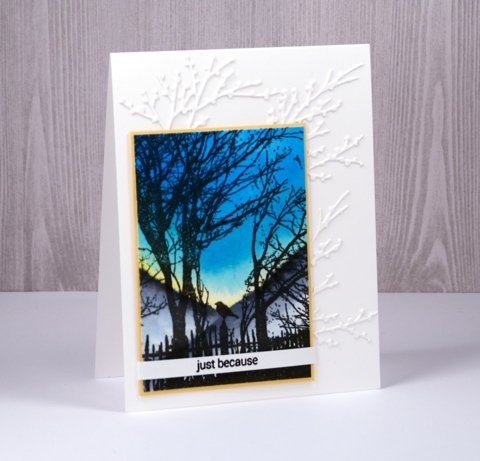 Today’s cards were made from panels stamped with the ‘peaceful moments’ stamp. 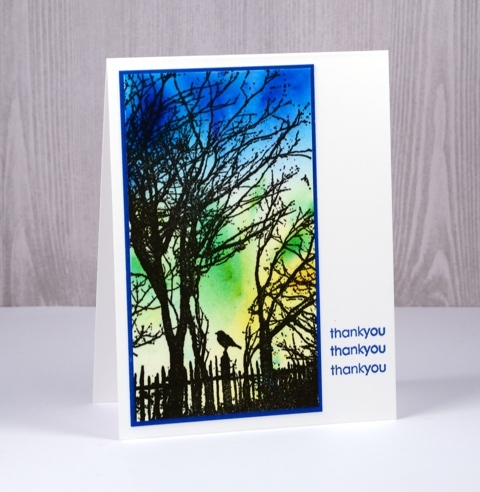 This thank you card was created by stamping the peaceful moments stamp over a brusho background. I sprinkled brusho on a craft mat, spritzed and swiped my watercolour paper through it. I matted and stamped the sentiment three times in a co-ordinating colour. The order for the just because card was a little different because I needed the image stamped first before I could paint the background. 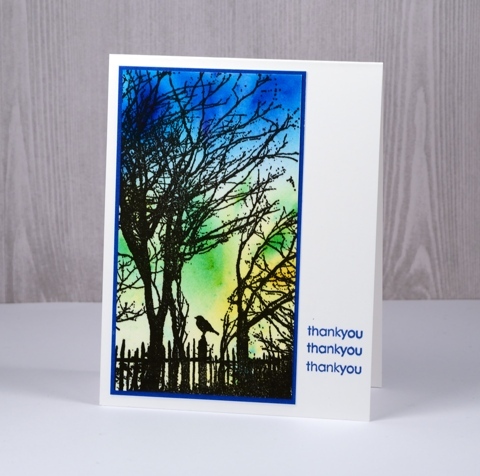 I stamped in versafine onyx black ink then painted a ‘V’ of yellow, a strip of pale blue then topped that with a darker blue. Once that was dry I painted grey hills below the sky. I matted in yellow then embossed a sentiment on a thin strip of cardstock to wrap around the panel. For added texture I attached some branch die cuts to the card base. 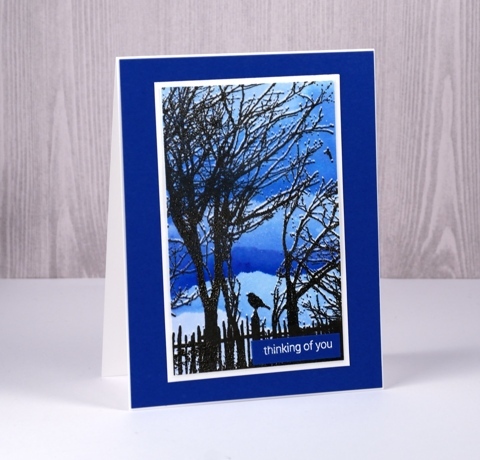 I used the embossed offset technique (described here)to create the thinking of you card then painted hills in blueprint sketch distress stain across the background, some were diluted and blended others I kept an hard edge and strong colour. 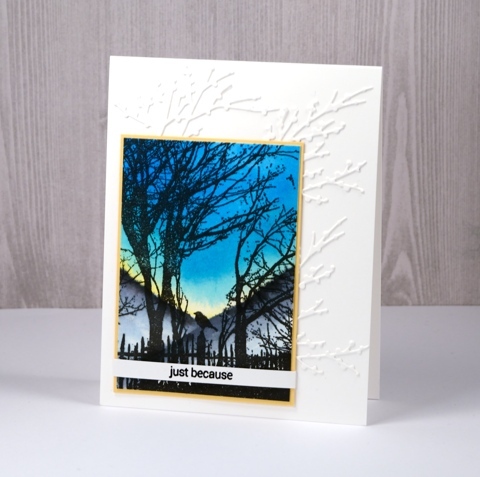 I hope these few cards give you a few ideas for working with silhouette stamps. What beautiful cards. I don’t know which I like best! Peaceful Moment is a beautiful stamp. So much going on in each of these. Thanks for “lots of ideas”! I love how each background is so different! I love the die cut branches behind your main panel. It makes it look like they are extensions of the branches on your panel. And the offset embossing is stunning! Thank you for sharing.